Learning a foreign language can give you a leg up on the competition and open up a world of experiences to you, but what about for babies? Does teaching them a foreign language make a difference? Can they even learn a foreign language? While you may not see a lot of six-year-olds looking for a quick way to learn Russian to succeed in their foreign language programs, this doesn’t mean that babies aren’t capable of achieving fluency in multiple languages. In fact, not only can babies start learning languages at a young age, but they can even learn them in the uterus. The benefits of exposing babies to a second or even a third language cannot be understated. Not only can they gain fluency in more than one language, but they can do it with a lot less effort than adults. How Can Babies Learn Multiple Languages? There have been plenty of studies proving that babies can learn multiple languages. The key, like with any language learner, comes from exposure. Babies minds are very plastic. Often described as “little genius” this exaggerated term highlights much of how a baby experiences and learns while preparing to live in the world. When babies are born, their brains go into overdrive. They’re continually working at decoding and adapting to the world they live in. In fact, they’ve been doing this since they were inside their mother’s womb. Evidence points to babies being able to distinguish their mother’s accent and language from others. And as babies continue to develop, they can pick up on sounds that adult humans cannot hear. This makes them even more adept at learning foreign languages. Another characteristic that makes babies “better” language learners than adults centers in their enthusiasm for learning. They aren’t bored by it. Through play, these curious individuals are rapidly tearing apart their world so they’re better adept at surviving in it. 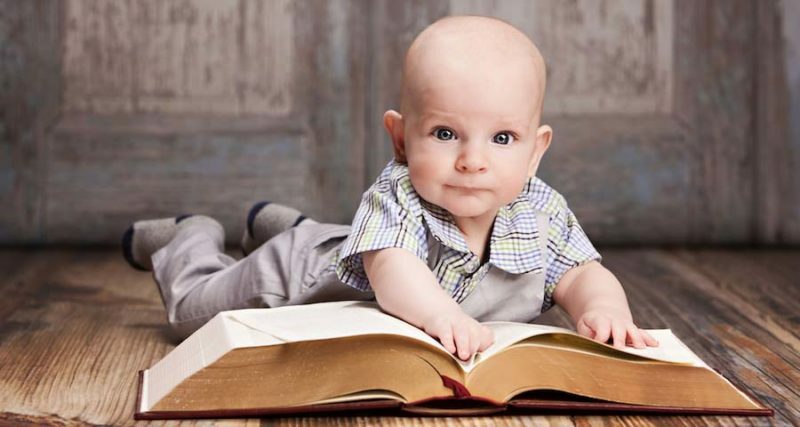 Babies also acquire language, they don’t “learn it” and as a result, they store language in a different part of their brains than adults do, making it easier for them to access. This process continues until babies reach a certain age. By the first year, they’ve lost the ability to pick up on unique sounds. And as they continue to age, their ability to quickly develop their skills in a foreign language depreciates. Once a child reaches puberty, there’s a sharp drop in the natural ability to learn languages. Brain Development: Babies brains need stimulation. The more exposure they have to play and meaningful interaction, the better adept they are to succeeding in the world. And learning multiple languages has been shown to increase gray matter and brain density, awarding better overall brain health for children well into adulthood. Faster Learning: Children learn through active play. They’re essentially full-time employees working towards mastering the world around them. They do not feel the pressure or stress of failure like adults. This means that they’re much more willing to make mistakes while learning and therefore easily develop fluency faster. Native Accent: While debateable among linguists, learning to speak before the “critical period” helps bilingual children achieve native levels of ability in the target second language. They’ll be able to talk in the second language without an accent. Increased Empathy:Studies have shown that children who speak more than one language are more accepting of other ideas and less critical of others. This is believed to be a result of understanding that tasks have multiple approaches. Better Attention Span: The ability to communicate through multiple languages acquires a keen focus on listening and proper word selection. The result is that children who are multilingual can apply these skills to other forms of learning, paying attention longer. Better Multitasker: Because actively moving between multiple languages involves advanced mental development, children who speak two languages can manage multiple tasks more efficiently than monolingual children. Improved Test Scores: Test scores among bilinguals tend to be higher than those who only speak one language. This is believed to be a result of an increased ability to understand how language functions. They can, therefore, more accurately gauge the proper response to questions. More Friends: Bilingual children are more comfortable making mistakes, this makes them less likely to be as introverted as their monolingual counterparts. They can also communicate with more people. More Languages: Becoming bilingual at a young age makes it easier to learn additional languages. This is because learning a second language is often the most laborious task towards becoming multilingual. Starting out with two prepares the child to learn languages more easily. Improved Overall Life: There are countless other benefits of learning multiple languages that transfer well into adulthood, from being a better prospect for employers to helping protect their brains from degenerative conditions like Alzheimer’s, the list goes on and on. How Can You Teach Your Child a Foreign Language? Teaching your child a foreign language is not difficult. If you’re a native speaker, then simply speaking to your child regularly in the target language will help provide them with the exposure needed to become bilingual. If you don’t, then there are programs, TV shows, and bilingual books available to expose your child to a foreign language. You can also hire a babysitter that speaks a different language to talk to your child during care. Being patient and understanding are the two most essential qualities for helping a child become bilingual. Know that they will mix up words and that it may take them longer to master both languages, but overall, they will be much better off learning two languages. As the benefits of learning a foreign language continue to mount, now, more than ever is the best time to introduce your child to a foreign language. And if you’re not fluent in a foreign language and are interested in how to study Russian or another foreign language, then you should give language learning with Optlingo a chance. It’s a proven program designed to lead to rapid fluency without the problems that plague other programs. This way both you and your children can enjoy the journey of being multilingual together. You both can experience all of the benefits knowing more than one language will provide you. And if you already speak a foreign language, then continue to encourage your children to do so knowing that you’re helping them secure a better overall quality of life.